Why Is A Code Checker Vital to Secure Development? Is your organization seeing significant IT costs for locating or repairing application defects? How much time is spent performing this process? Security vulnerabilities and defects are expensive. A code checker is software designed to perform code analysis to review source code lines prior to entering the production phase of a development project. By embedding code checkers into the development process, organizations are able to uncover flaws earlier and quickly remediate their potential impact, resulting in reduced costs, more secure software, and a higher degree of efficiency. How Does Code Checker Software Benefit Testing? How solid and secure is the code your team develops and what are the potential impacts of inefficient practices? If you have ever pondered this question, you know how difficult it is to answer. Inserting code checker software in the development process is becoming standard practice, and is typically combined with traditional testing processes to improve test coverage and better understanding of the codebase by testers and developers alike. Code checkers that employ static analysis help development teams identify vulnerabilities within non-compiled programs before passing code along to testing. Source code analysis helps testers catch flaws long before they affect business operations, infrastructure, or customers. Static code checkers offer precise information about the line of code where the defect resides, the rationale as to why the code is flagged as a violation, as well as educate development teams about code best practices. The ability to scan binaries is beneficial if your organization needs to evaluate work completed by outside vendors. A code checker with this capability can be used to monitor supplied quality and ensure delivered products meet architecture standards. These qualities are essential to keeping false positives low and providing the information necessary for identifying application improvement opportunities. A code checker incapable of supporting all utilized languages or unable to offer objective, reliable metrics can end up being a complete waste of time. Most code checker solutions are installed on a developer’s local machine, and search for code level issues such as code syntax, code style, and documentation completeness. While this practice is effective at the code artifact level, and can certainly improve software quality, it does not address software quality at a system level, and is often disabled by developers due to the amount of interruptions it generates during coding. This holistic approach allows IT organizations to quickly focus in on issues that will cause the most painful disruptions if left unattended. CAST is able to deliver this unique value because it is the only solution capable of checking multiple languages and detecting critical vulnerabilities across application layers. 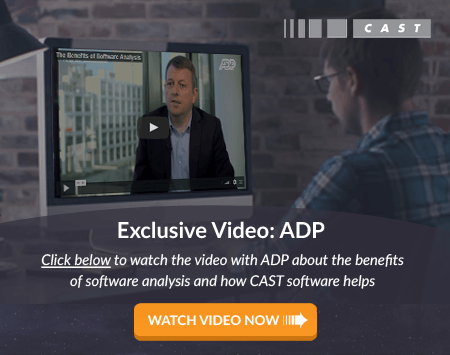 CAST AIP's benchmarking may be used continuously to monitor productivity based on the number of completed functions, detect potential flaws, or evaluate programs supplied by outside vendors. By using AIP, your organization will be able to create secure, robust software and remedy existing application flaws. To see how we can help you, get a free demo of our code checker today!